The first panda born in Taiwan has recovered and been reunited with her mother. The Taipei Zoo has welcomed a baby panda named Yuan Zai to its community. The one-month old cub, born to parents Yuan Yuan and Tuan Tuan, is the first panda ever born in Taiwan. Although mother and cub are being kept in separate cages for safety reasons, a video made the rounds online yesterday of the mother and baby’s reunion last Friday. When Yuan Zai, a female, was born on July 6 the little critter weighed a mere 6.5 ounces. After mother Yuan Yuan “slightly injured” Yuan Zai, the cub was separated and placed in an incubator to receive round-the-clock care. The mother and cub met last week through the bars of a cage when Yuan Yuan licked her baby on the nose. The Los Angeles Times notes that pandas are especially vulnerable at birth due to the differences in size between mother and cub. A baby panda is typically around seven inches in length and weighs only 1/900th of its mother’s weight, the paper wrote, citing the National Zoo. Zoo officials were on edge for fear that Yuan Yuan may accidentally injure or kill her cub. The outcome – Yuan Yuan picked up Yuan Zai in her mouth and cradled her – came as a great relief. The pair also made noises, suggesting communication. After the cub was breastfed, the pair fell asleep. It will be several weeks before Yuan Zai will be able to walk or stand. Following the “test” meeting, zoo staff fed Yuan Yuan honey and placed her baby back in the incubator. Yuan Zai’s birth is not only a chance for the world to bask in her cuteness, but is also important for the continuation of a species on the brink. There are only 1,600 pandas left in the wild, and breeding and raising the animal in captivity is a delicate process. As the Huffington Post notes, giant pandas have a very short breeding window and, along with the risk that cubs can be smothered by their mothers, they are susceptible to disease. Parents Yuan Yuan and Tuan Tuan were diplomatic gifts to the Taiwanese government from the Chinese mainland. The animal was chosen by the World Wildlife Foundation for its logo and is the rarest species of bear, living in China’s western mountains. 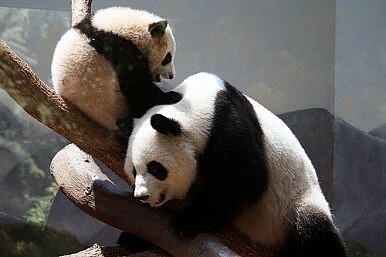 Adult pandas reach up to 330 pounds and live entirely on a diet of bamboo. The blobfish is at the center of an effort to protect our less cuddly creatures.